In this example, there is a list of screen dimensions, with the first width — 400 — in cell B4 and the first height — 300 –in cell C4. 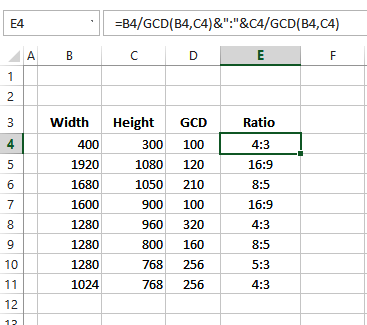 To calculate the ratio for each screen, the formula will use the GCD function, which returns the Greatest Common Divisor, for two or more numbers. NOTE: In Excel 2003 and earlier, the Analysis Toolpak must be installed, to use the GCD function. To calculate the ratio, the width will be divided by the GCD and the height will be divided by the GCD. A colon will be placed between those two numbers. The result is 4:3 — the ratio for those screen dimensions. 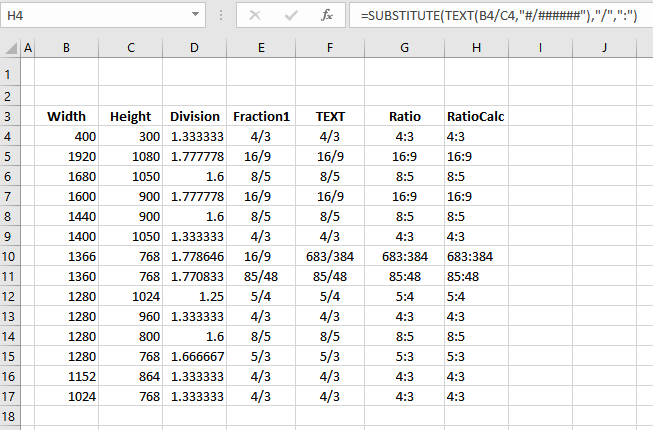 Another way to calculate ratio is with the TEXT and SUBSTITUTE functions — these functions work in all versions of Excel, without the Analysis Tookpak having to be installed. To calculate the ratio for each screen, the formula will divide the width by the height, and format the result as a fraction. Then, the slash will be replaced with a colon, to create the ratio. To calculate the ratio, the width will be divided by the height, and formatted as a fraction. A colon will replace the slash.